Nperfect is how I describe Google’s newest, and only, computer. If you’re going to manufacturer one thing, then it should be exceptional, which is the other way I describe Chromebook Pixel LS. The company introduced the original in February 2013, available in two configurations. 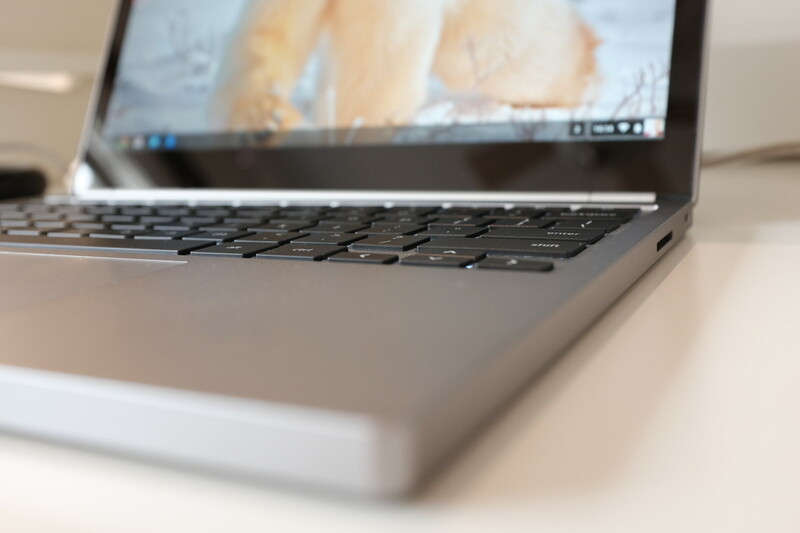 Twenty-five months later, the notebook refreshed—refined rather than revolutionized—beating Apple to market shipping a laptop with USB Type-C, which brings new connectivity and charging options. FedEx delivered the costliest Chromebook configuration to my door on Friday the 13th, in March. I ordered the newest Pixel from Google two days earlier, within hours of the laptop’s launch. I use no other computer. It’s more than my primary PC and could be yours, too. This laptop rests at the precipice of future computing, for those open-minded enough to welcome it. This review is purposely preachy, which reasons hopefully will be apparent should you read all 1,800 words. Two Pixel models are available, both for less than the original. For $999: 12.85-inch touchscreen, 2560 x 1700 resolution, 239 pixels per inch, 400-nit brightness; 2.2GHz Intel Core i5 processor; 8GB RAM; 32GB flash storage; Intel HD graphics 5500; backlit keyboard; glass touchpad; Bluetooth 4; WiFi AC; two USB Type-C ports; two USB 3.0 ports; SD Card slot; and, of course, Chrome OS. The $1,299 model doubles RAM and storage and swaps the processor for 2.4GHz i7. Dimensions: 297.7 x 224.55 x 15.3 mm (11.7 x 8.8 x 0.6 inches). Weight: 1.5 kg (3.3 pounds). Construction is magnificent. The computer looks and feels solid, like a boxy Volvo might to an auto shopper. 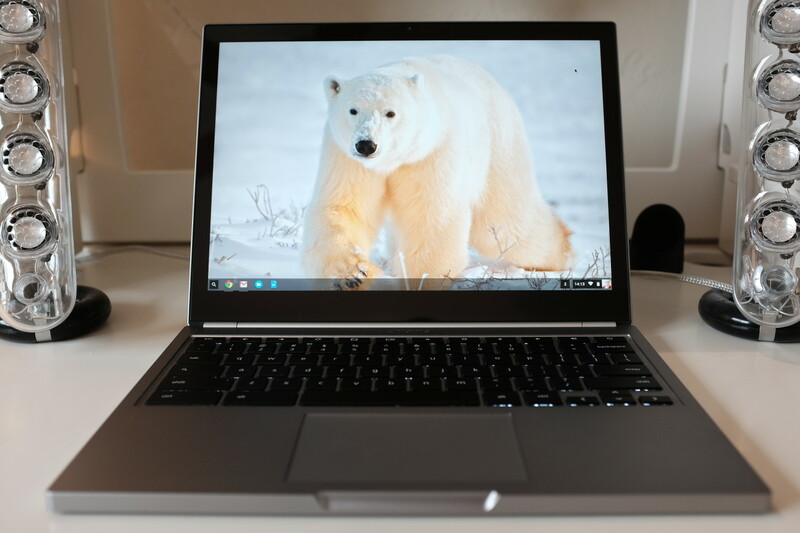 From a hardware and operating system perspective, Chromebook Pixel is finely balanced. Performance is generally smooth and the ergonomics are superb. There’s a quality about the tight hardware, software, and services integration that can’t be completely imitated or fully appreciated by using the Chrome browser as primary user interface on Mac or PC. Heming Leira owned the original Pixel and received its successor nearly a month ago. Like me, he describes the LS model’s performance as “smooth”. I am not a big fan of benchmarks, but they matter to some readers who might want performance quantified. I ran Octane 2 on Chromebook Pixel LS: 26230, in Guest Mode. Keyboard and touchpad are best of class, both improved from the original. I type faster than on any other laptop. Ever. Gregory Mannix agrees: “Trackpad and keyboard are both better (had no idea that was possible)”. Mannix, who also owned the original Pixel, is “surprised” to “actually notice the difference in weight. The build is almost identical, but everything seems just a bit tighter and more thought out. It’s really the perfect machine for me”. The high-resolution touchscreen is matched by no other notebook. The display ratio is 3:2 rather than 16:9, which is exceeding better for consuming, or creating, web content. Battery life varies depending on use. I consistently get about eight hours, give or take. Google claims up to 12 hours. I don’t see it. Pixel is the writer’s dream machine—a responsive extension to the creative mind when matched with webapps and cloud services from Google and third parties. Other content creators could be surprised, too, by the tools available for producing photosets, podcasts, or videos. The major limitation is your thinking—clinging to old, imprisoning habits fostered during the personal computing era—not the selection of meaningful applications. For all its goodness, Chromebook Pixel is an acquired taste. Think of it as the Vegemite of computing. Most people won’t like the flavor, but those who do love it. That’s the cute analogy; another is more appropriate. Think Leica cameras. The line of rangefinders are pricey, specialized, and limited. Many other digicams offer more features, for considerably less cost. But measured by image quality, balance of manual controls, and choice of exceptional lenses, Leica leads a category chosen by few photographers but among them many looking to create art. I similarly see Google’s Pixel. Not everyone will want one, but those who do will gain maximum value. Like Leica, Chromebook Pixel is a lifestyle decision. You choose to do with less to do more. Chrome OS doesn’t support legacy local applications like Microsoft Office or anything Apple sells. They are the past. Contextual cloud computing is a future quickly becoming the present, and where you will be using this laptop. “The Pixel is my primary machine for everything”, says David Hoff. “It’s my own personal device, but it is the primary machine that I use at work—at the desk—in meetings, and for travel”. Google’s marketing tagline for Chromebook is “For Everyone”, which Pixel is not—for either $999 or $1,299, when its siblings typically sell for under $300. But neither are pricier Mac laptops for the masses. As a category, Chromebook is for everyone when including a classy and compelling computer primed for creatives. Pixel presents a choice for the few among the many—people who are willing to spend more to get greater value and who might otherwise choose an Apple. The new MacBook, which comparatively is underpowered but offers similar screen size (though different dimensions) starts at $1,299. Same beginning price applies to 13.-inch MacBook Pro with Retina Display, which screen resolution is closer to Pixel’s but display isn’t nearly as bright and lacks touch. The Macs offer considerably more storage capacity—128GB or 256GB at $1,299 for Pro Retina and MacBook, respectively. They need the SSDs, for all the legacy crap code that the computers run. Pixel packs less because less is needed for the concept: Running webapps in the browser and storing everything meaningful in the cloud (e.g. remote servers). Touchscreen is another differentiator, and Google’s default font renders more smoothly and better pleases the senses. I find eye strain to be considerably less using Pixel for prolonged periods compared to MacBook Pro. Meanwhile, touch is addictive, adding utility once you really start doing it. The point: Using Apple marketing lingo, anyone who can “Think Different” should consider Chromebook Pixel before a Mac notebook. Everyone else clinging to old computing habits or bloated, legacy applications should not. “I completely agree that this device has a very specific market segment”, Hoff says. “However, it is an amazing choice for anyone that uses modern technologies”. Are you modern? Answer yes, consider Pixel. Answer no, don’t. Hoff, who is cofounder of and chief technology officer for Cloud Sherpas, falls into the “modern” category. His company helps other businesses better adopt anytime, anywhere computing, which philosophically is the core concept behind Chromebook and how it fits into the larger lifestyle around other Google products, including Android phones, and services. He received his Chromebook Pixel 2015 the day before I did. Mannix also fits the “modern”, anytime, anywhere computing category. He is a web developer for Charles Koch Institute. Pixel epitomizes the Chromebook philosophy in ways no other computer in the category can. The distinction is important because of the gross misunderstanding that Chromebook means cheap—as in purchase cost. As previously mentioned, the majority of Pixel’s siblings sell for less than $300. They offer excellent value but typically don’t provide processor and memory enough to be the one and only computer, particularly for content creator types. I badger the point because it cannot be restated enough times. 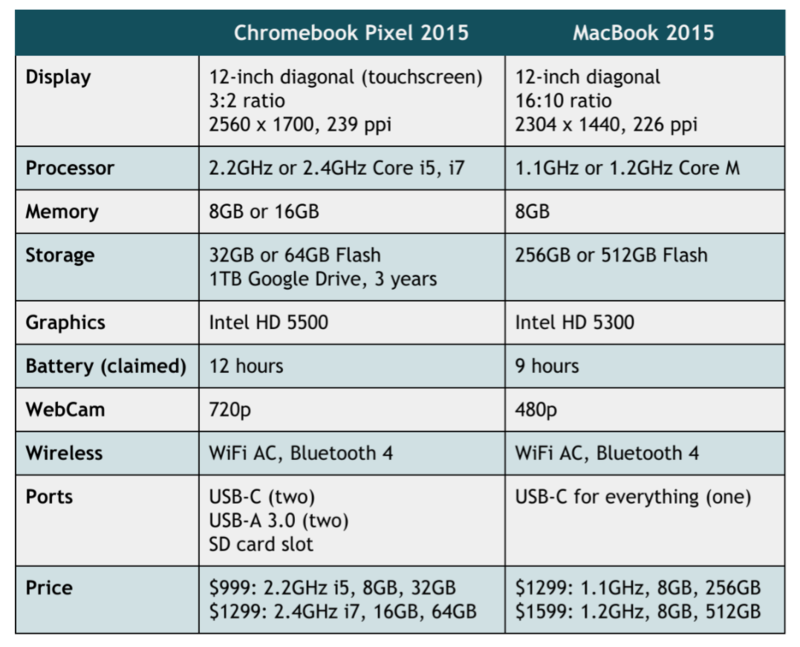 Chromebook is not about cheap computing. The category is, to reiterate and reemphasize, about contextual cloud computing. Pixel’s core benefits embrace and extend the underlying philosophy, which emphasizes simplicity and productivity, while stripping back complexity and distraction that disrupt the mind’s creative flow. Touchscreen is exceptional value-add for price. No Mac has one, nor any Windows laptop with same resolution in the cost range. Like other Chromebooks, Pixel setup is this: Access WiFi network, sign in to your Google account. “From unboxing to inbox, it takes about one minute to setup and fully configure a Chromebook”, Hoff says. “The new Google Pixel is a great machine”. I can’t disagree. Otherwise, save your money or tip-toe into the Chrome lifestyle by choosing a lower-cost OEM model. Rah-rah as this review reads, reality is this: The Chromebook concept may not be for you.